Tel Aviv (AFP) – Tens of thousands of Arab Israelis and their supporters chanted against “apartheid” and for “equality” on Saturday in central Tel Aviv at a rally protesting a law that declares Israel the nation state of the Jewish people. AFP / Ahmad GHARABLI. Arab Israelis and their supporters demonstrate during a rally to protest against the ‘Jewish Nation-State Law’ in the Israeli coastal city of Tel Aviv on August 11, 2018. At Saturday’s rally, protesters accused the Israeli government of being an “apartheid regime”, shouting in Hebrew and in Arabic, “equality, equality” and “apartheid will not pass”, AFP reporters said. The rally was organised by groups representing the Arab Israeli minority, while the one that took place last Saturday had been organised by the Druze. Yael Valia, a 45-year-old woman who works for a start-up, waved an Israeli flag and described herself as a “Zionist”, adding that “this is why we must guarantee equality for all the citizens of this country”. She said she brought them to the rally “because their future is at stake”. 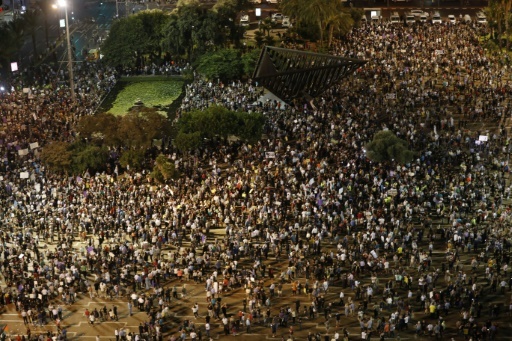 Amos Shoken, publisher of the Israeli newspaper Haaretz, was also present at the rally and urged Arab Israelis “not to despair” and to continue to mobilise against the controversial law. Featured Photo: AFP / Ahmad GHARABLI. 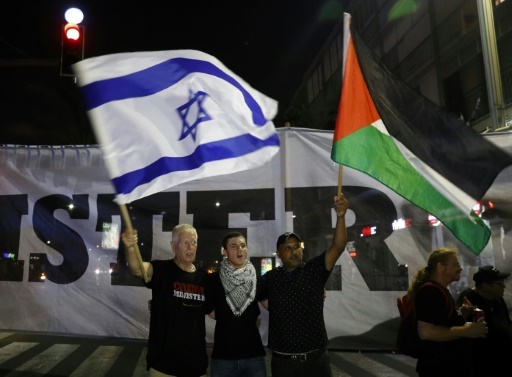 Arab Israelis and their supporters carry a Palestinian flag (R) and an Israeli flag during a protest against the Jewish Nation-State Law in the Israeli coastal city of Tel Aviv on August 11, 2018.